The overlooked Accessory: Nail Polish. - Just Off 7th Ave! Yes.. We all go to the salon, Manicure/Pedicure and all the works, but I usually see classic french, neutral or red. What happened to the fun in color? Don’t you remember growing up, in high school painting your nails blue or green, or yellow, or fushia? I sure do. I was browsing through our followers on twitter and I came accross @GussiedGirls. They run a blog about products they love to use, but mainly about nail/beauty care! These ladies really know how to accessorize with nail polish. We should definitely consider nail polish as an accessory. What better way to complete your look? After all, wasn’t Monsieur Louboutin’s Red Sole inspired by a great manicure? I believe It was his assistant’s red and black manicure that gave him the inspiration to create what now has become a staple accessory in the fashion world, the Red Sole Shoes. As I was browsing through gussied.blogspot.com I was inspired! I am going to my local drug store and buying Glittery nail laquer!!! Here are some of my favorite pics posted. 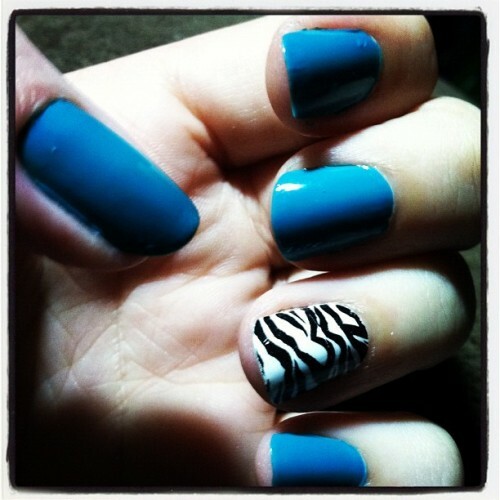 I absolutely love the blue Nail ploish with the zebra accent! would totally look amazing with Designer Kate Haber’s Quinta Del Sordo’s Cobalt Blue Wrap Bracelet. Check Out gussied.blogspot.com for some fabulous nail tips! !